204 Events’ December Featured Designer is Wayne Gurnick. Last week I watched him erect a 20+ foot tree constructed from a myriad of exciting items he found in our event and prop showroom. He’s “hands on,” to say the least. We had a moment to chat after he climbed down to his safety. 204: When Sira asked you to do this, did the idea of building a Christmas Tree immediately come to you? Wayne in progress of his whimsical holiday tree! Wayne: Yes. My first priority was to showcase your products and when I thought about Christmas, I thought a tree built from your Chiavari chairs would be great! Opulent. Interesting. Imaginative. Sorta kooky or crazy. And definitely beautiful. I like that it features all the designery brick-a-brack found in our warehouse. What is the most exciting element here for you on the tree? The light fixture that we suspended over the top of the tree… it is just the icing on the cake! For me, it’s all about family, friends and traditions. I am Jewish and we have so many traditions to share with family and friends. An elegant atmosphere created by Wayne Gurnick. Photography by Viera Photographics. Why didn’t you do a Chanukah or non-denominational inspired set-up? Most people identify a tree with the holidays, no matter what they celebrate, so in my mind I can decorate Christmas trees and celebrate Chanukah at home. Either way, I am wishing everyone joy and happiness whatever they celebrate. How did you get started in event design? I grew up in LA and in junior high and high school I worked for a very prominent florist. I was doing all the hoity-toity parties and weddings with them and always knew that eventually I’d own a flower shop. Can you explain your “Ultimate wedding planning system” I saw on your website? It’s a 24 hr web access to everything I do on a daily basis for people across the country and around the world that don’t necessarily have the funding or ability to hire a wedding planner. It’s not often, but I have had calls at 2 in the morning. We have an enormous database of services all over the country. So depending on the level of service you purchase on the site, you have access to my resource referrals. And based on the online survey, I will already know your budget, location preferences, and how many people, all the particulars, once you contact us personally. And since I have done weddings all over the country, I can refer them to a specific florist or event space depending on their budget. Shutters on the Beach wedding designed by Wayne Gurnick. Rentals by 204 Events. Photography by Christine Bentley. What’s one of the most exciting weddings you’ve planned? We did a wedding at Shutters On The Beach in Santa Monica. 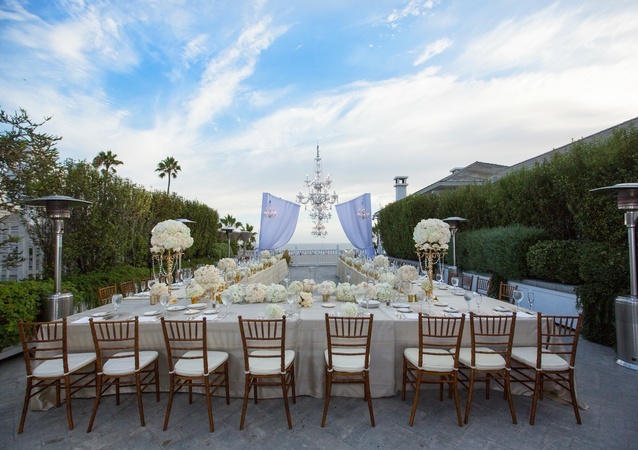 204 Events provided the rentals and lighting… Beach Ceremony and Pacific Terrace Reception… Suspended Chandeliers! Loved this wedding. I do have others but once again, wanted to feature 204 Events. The photos say it all! Can you give me a one word that describes working with you? Ha Ha. Yes! What’d they say? It’s not my word. But sure. I’d agree. There’s my inspirational moment with Wayne. Happy Holidays. Wayne’s holiday design. Photo Credit Rebecca Cabage.